Cirrhopetalum Page SUBFAMILY Epidendroideae, TRIBE Dendrobieae, SUBTRIBE Bulbophyllinae. 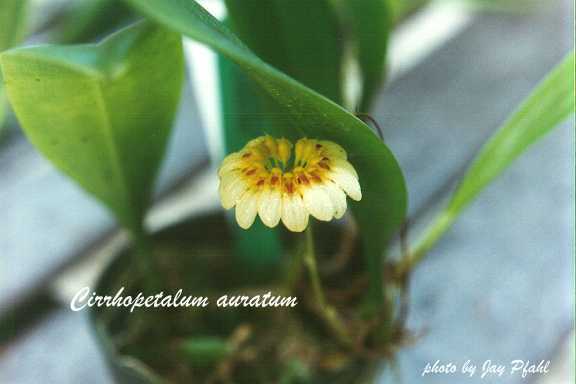 Closely allied to Bulbophyllum and often misnamed as such and for years considered to be Bulbophyllum, they have several small flowers set in a semicircular shape each with its own moving orb that is actually a hinged column attached to the labellum, and they have long hairs, generally purple, growing on the upper sepal and petals. Seidenfadden states that there are 148 different species spread through Asia east of India and on into the Pacific islands. I grow these most often in a wood slat basket where they grow into thick mats completly covering it, but, I also have good luck making a shallow tree fern boat and using a four wire hanger for more ranging species like auratum and biflorum.